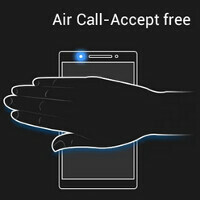 One of the cool features available on the Samsung Galaxy S4 is the Air Call Accept feature. With this feature, a call can be answered without the user of the phone touching the handset. To answer a call, the owner of the device merely swipes his hand over the infrared sensor that is next to the earpiece speaker, and the phone will respond appropriately. Now, you don't have to own a Samsung Galaxy S4 to use Air Call Accept. A free app from the Google Play Store will let you wave your hand over the proximity sensor on your Android phone and have the phone respond exactly how the Galaxy S4 does. There is both a paid version of the app along with the free one. The paid version of the app gives you the option to ignore a call, turn on the speakerphone automatically when you answer the phone, and send an email when you reject a call. The app is available from the Google Play Store for those sporting an Android powered handset running Android 1.6 or higher, and with a proximity sensor. Now most Android users will be able to answer their phone when it rings, no matter how dirty, greasy or wet their hands are. Nice app...as close as u can get on devices without the infrared sensor..not exactly as good as the one on s4(infrared sensor) but good enuf.. If any Sammy haters download this app this would just go to prove they are 'jealous' haters. Nevertheless, it won't be as good without proper software optimization and hardware requirement of infrared sensor which sammy provides! I disagree I think its shows that you can get some of the features but can choose which ones to add and can delete at anytime, unlike on touch wiz. However the touch wiz version is still better as it is optimised in to the os itself unlike this app. Nice try! It works just as well... in fact, better, due to the many more options it gives. What happens if you install the app on an s4 is what I want to know. Well i did..if ur air gestures are off then the app ll work as usual..but if its on then the app has no use cuz the infrared sensor detect the hand gestures from a larger distance as compared to the proximity sensor..plus samsung software provides some gesture animation so u cn be more in control of the function..
how can you reject a call? wait till the other person ends the call? All the google play edition s4 and htc one etc, can load apps that they need as they go, saving internal mb space. I wonder if they will make a GPE Note III? With a Android/Samsung S-Pen functions App and such. What if your phone is in your pocket? The sensor is already covered. Would it just answer? I had my photon doing this.